Troubleshooting a video call can often lead to finger pointing or finally just throwing in the towel. Vyopta understands this, so their team of video and network engineers came up with an effective, and easy-to-follow, troubleshooting process. 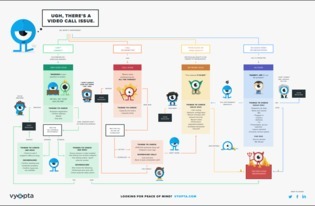 In the following infographic, discover a step-by-step guide that will identify whether the network, an end-user, AV equipment or your video conferencing technology is to blame for video call errors, and what you can do.